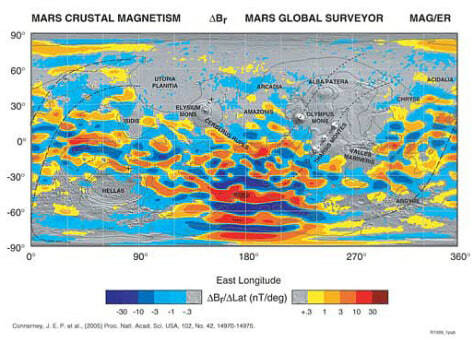 This is a map of the magnetic field of Mars observed by the Mars Global Surveyor. Red and blue stripes represent magnetic fields with opposite directions, with darker hues representing more intensity. The map is superimposed on a topography relief map from the Mars Observer Laser Altimeter instrument.